PROBLEM: fires and explosions can result from electrostatic discharge in hazardous areas. Even relatively small sparks have sufficient energy to ignite many flammable vapours, gases, and airborne dusts. Where this risk exists, static grounding and bonding clamps are required wherever mobile or portable conductive plant items such as drums and vessels are used. It is necessary for the clamp to make a low resistance connection to enable static charges to be safely dissipated to ground before the energy available for discharge builds up to dangerous levels. Most drums, containers and other equipment have coated surfaces from new, then often suffer build up of further insulating layers such as paint, resins, adhesives and sunstances inherent to the process environment. Tests have shown that ordinary grounding clamps often indicate very high resistance readings when clamped onto conductive objects with insulating surfaces. This may result in the clamp being physically attached in the eyes of the operator, but not actually dissipating static electricity safely. 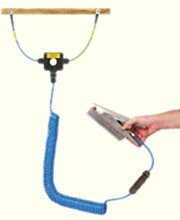 SOLUTION: Bond-Rite & Earth-Rite self testing and indicating grounding clamps, cables and monitors. 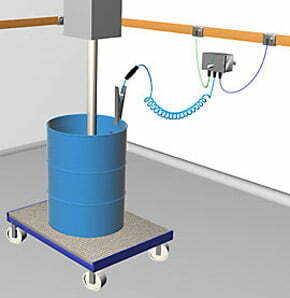 The revolutionary design of the Bond-Rite CLAMP provides enhanced safety and security by continuously testing the connection of the clamp to the container or other conductive item of plant, and providing the operator with visual verification. The sensing circuit itself meets intrinsic safety codes. 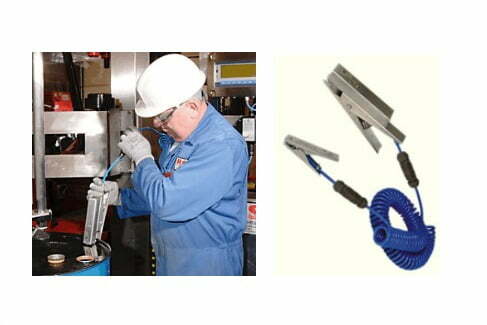 The Bond-Rite CLAMP is supplied with a dual conductor cable, junction box, clamp stowage pin, and ground leads. 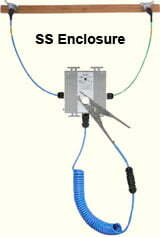 The intrinsically safe monitoring circuit electronics and battery are contained within the clamp. 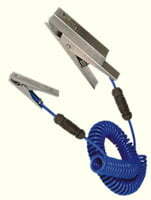 The quick disconnect allows the clamp to be easily removed for battery replacement in a non-classified area. Tungsten carbide tips bite through coatings and rust to achieve good electrical connection. Note: grounding bus-bar shown in illustration at right is not supplied. Clamp Body material: 304 stainless steel Contact points: two, tungsten carbide Jaw opening: 1″ max. The Bond-Rite EZ provides a portable self-testing bonding solution for those times when liquid or powder transfers need to take place and no permanent grounding monitor is available. The unique Bond-Rite CLAMP is combined with a Hytrel protected spiral cord and secondary clamp to create a reliable bond between mobile equipment and a metal structural ground. Tungsten carbide tips bite through paint, rust, and other surface deposits. 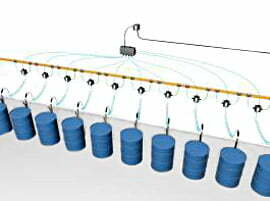 The intrinsically safe monitoring circuit electronics and battery are contained within the primary clamp. 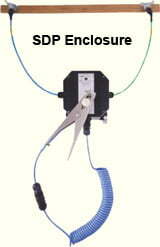 Quick disconnects allows the clamp to be easily removed for battery replacement in a non-classified area. Note: ground rod shown in illustration above is not supplied. Pulsing green LED indication on wall mounted electronics enclosure. The Bond-Rite REMOTE provides visual verification of successful grounding at a wall mounted enclosure instead of at the clamp itself. These stand alone installations are battery powered, providing up to six months operation with an average usage of six hours per day. There’s a choice of stainless steel clamps in two sizes, and the monitor can be ordered with either a static dissipative polymer (SDP) or stainless steel (SS) housing. Cable Hytrel coated spiral dual conductor cables in various lengths. Fitted with in-line quick-connects. Battery 9V lithium manganese ULTRALIFE U9VL-J (included). Battery life: Up to 6 months with equipment grounded for an average of 6 hours per day. 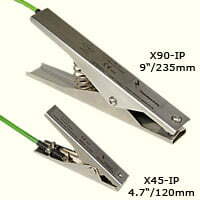 Options Alternative cable lengths, cable reels, sunlight hood for REMOTE module. 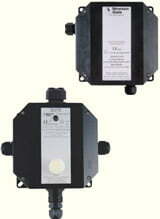 The Bond-Rite REMOTE EP provides economical monitoring of up to ten stations using a common AC powered supply module. Also recommended when a single or small number of stations require continuous monitoring without concern for battery life. In other respects the performance of the REMOTE EP monitor is identical to the battery operated version above, with the same choice of grounding clamps and materials for the monitor enclosure. The power supply module comes with a dissipative polymer (SDP) housing and can be installed in either a Division 2 hazardous location or an unclassified area. 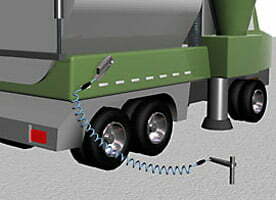 Options include self-retracting cable reel (in place of spiral cable), and a choice of AC or DC power supplies. Cable Hytrel coated spiral dual conductor cable, fitted with in-line quick-connects.